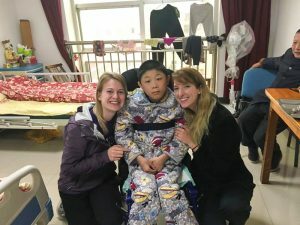 At the time of our visit to the Xinzhou District of Shangrao, our two kiddos Aubrey and Tyler were temporarily living in a nursing home with a few other children and we were told that their orphanage was being renovated. It was great to see the children and they both looked to be well fed. We were glad to be able to train Tyler’s ayi on proper technique for safe transfers. Aubrey still loves to dance, and we were happy to play some music exclusively for her on a cell phone. We rounded out our visit with a couple new toys for our beloved kiddos!